1. Place the potato slices in some lightly salted water and bring to a boil. Parboil potatoes for about 5 minutes. 2. Remove and drain. 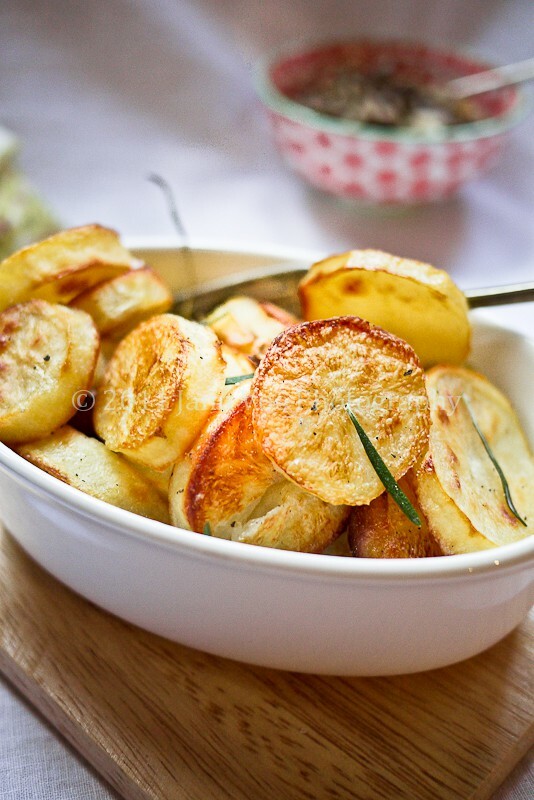 Place potatoes in a colander and toss well to make sure the slices rub against each other. Leave the colander with the potatoes on top of the pot and allow to steam dry. Pre-heat the oven at 180 C/ 365 F.
3. Add the olive oil and rosemary leaves to the baking tray for tossing of the potatoes. Add the salt. Add the potato slices and toss well to combine. Add garlic cloves. 4. Roast in oven for about 40 minutes or until tops look crispy and brown. Serve as side dish. Sprinkle more sea salt on the top before serving. You can remove the garlic cloves before serving.